FHP V-Belts. Bando Duraflex, Gates TruFLex, Thermoid FHP Glassflex, Dayco DuraPower, John Deere Lawn & Garden, Goodyear FHP, MBL Super FHP, Optibelt LD, and TB Wood's Light Duty Premium. LIGHT DUTY V-BELTS - FHP V Belts - 2L, 3L, 4L, 5L Sections. Our Light Duty V-Belts Cross Reference with Bando Duraflex, Gates Truflex, Thermoid FHP Glassflex, Dayco DuraPower, John Deere Lawn & Garden, Goodyear FHP, MBL Super FHP, Optibelt LD, Durkee Atwood, and TB Wood's Light Duty Premium. We offer a very limited selection online at this time. Please call (317) 519-9020 if you don't see what you need. We're happy to help! 2L Light Duty V-Belts (FHP) 2L Sections - CLICK HERE! 2L Section FHP V-Belts for Power Equipment, Lawn & Garden Replacement Belts, Appliances, Lathes & Drill Press, and Industrial applications. 3L Light Duty V-Belts (FHP) 3L Sections - CLICK HERE! 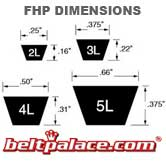 FHP 3L Section belts. These types of V-Belts are Suitable for Outdoor Power Equipment, Lawn & Garden Replacement Belts, Appliances, and Industrial applications where fractional horsepower (FHP) belts are typically used. 4L Light Duty V-Belts (FHP) 4L Sections - CLICK HERE! 4L Section FHP Belts. These types of V-Belts are Suitable for Outdoor Power Equipment, Lawn & Garden Replacement Belts, Appliances, and Industrial applications where fractional horsepower (FHP) belts are typically used. 5L Light Duty V-Belts (FHP) 5L Sections - CLICK HERE!